Module splits input into two signals with different frequency ranges. 1-pole highpass filter for stereo signals. 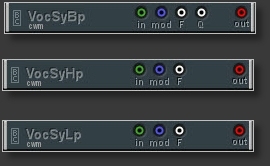 Filter modules originally made for Vocoder, but can be used for other purposes as well. 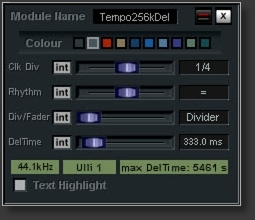 Tip: use different audio signals (oscs) both for in and mod inputs. 1-pole lowpass filter for stereo signals. 4 delays which can be looped. the X version can crossfade between dry and wet signal. Insert for 4 Stereo Fx. The order of the inserted Fx can be changed by using the 'Source' control. PC delay, up to 5461ms delay time. Inbuilt Clock Divider. Ulli and SampleRate settings are displayed just for informational purpose.